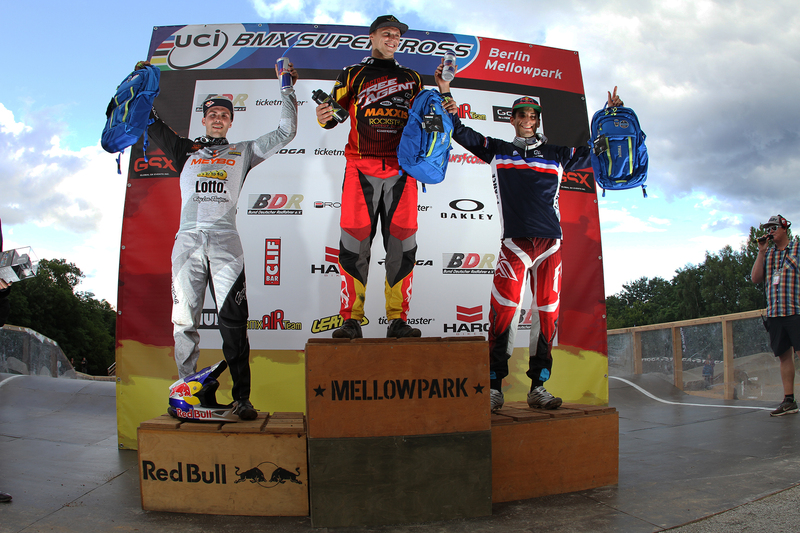 First German UCI BMX Supercross World Cup wrapped up. For the first time in BMX Supercross history, the fastest BMX riders on earth traveled to Berlin, Germany for a World Cup round. In ‘on and off’ weather conditions, it was a challenge to get the race finished as the rain put some delay on the original program. The day started off in bright weather and the qualification rounds showed close and aggressive racing at the one-of-a-kind BMX Supercross track at Mellowpark. Many top favorites were eliminated in the qualification rounds of the Men’s class making the final an unexpected mix with riders from seven different countries. Maris Strombergs proved to be in amazing shape on his first race back on the Supercross track and used his first straight power to get out in front and never looked back to take the win. Red Bull athlete Twan van Gendt from the Netherlands finished second in the finals and was following Maris to the finish line, trying not to make any mistakes and satisfied with second place points. Twan finished right in front of Frenchman Joris Daudet, who rounded up the podium in Berlin. Because of the podium spot, Daudet moved up to second place in the 2014 World Cup Supercross standings sitting behind leader Liam Phillips (GBR) and right in front of Australian Anthony Dean. 2012 Olympic Gold Medalist Mariana Pajon (COL) got the holeshot in the women final and was chased by seven women around the track. Right behind her was current UCI World Champion Caroline Buchanan (AUS) who used all the tricks of the trade possible to have an advantage over the competition. “I’m glad we came here early with the Australian team to get some extra practice in. I had three moves lined up if I didn’t get the holeshot,” said an exhausted Buchanan. She continued: “I was a bit too far behind Mariana Pajon to do the first two but the last move was in the last flat turn which not a lot of girls would do. My mountain bike experience surely helped there.” The Australian swapped spot two for the lead on the last straight and crossed the finish line in first place. Mariana Pajon (COL) finished second, followed by Manon Valentino from France, who managed to hold off Stephany Hernandez (VEN) on the last straight to grab the last podium spot. Buchanan is leading the World Cup standings with 605 points with two more races on the program. 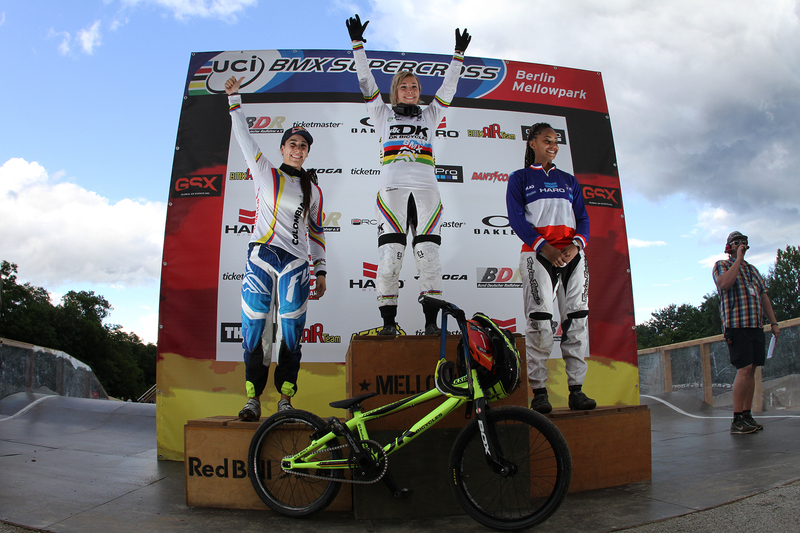 Next UCI BMX Supercross World Cup round will take place in Argentina.